The Write Spot: Reflections reviewed by Nancy Julien Kopp. “If you want to write and don’t know how to get started, this book is for you. If you are a writer and feeling stuck, this book is for you. The book is a collection of short stories, poems and vignettes to entertain but also to inspire writing. Each contributor includes a short bio and a few paragraphs on Why I Write after their writing contributions. I found some illuminating statements in the Why I Write sections. I also found so a great deal to enjoy in the offerings of the different authors. At the end of each contributed story, poem or vignette, the prompt the writer used is given. The editor, Marlene Cullen, has a blog filled with prompts. She also uses prompts and freewriting in her writing workshops which she teaches in California. I would love to live close enough to attend. Even halfway across the country, I can benefit from the prompts on the blog. I found that reading the piece and then the prompt in Reflections was sometimes an ‘aha’ moment. Also a learning moment. I found myself thinking many times “Look where this writer went with a simple little prompt.” I thought about using the same prompts as the authors in the book have done for my own writing exercises. I think it would benefit any writer or wannabe writer to use the prompts for inspiration. Even non-writers, those who are readers only, would find some enjoyment in the variety of offerings in this book. If you’re looking for inspiration to write, try this book. I would also urge you to take a look at Marlene Cullen’s website to learn more about her and to take advantage of the prompts she offers daily as well as a wonderful resource page where she lists blogs for writers (yours truly included), websites for writers and places to submit your writing. A true treasure trove for writers. Nancy Julien Kopp has been published in 22 Chicken Soup for the Soul books, several other anthologies, newspapers, magazines and ezines. Her writing includes award winning fiction for children, creative nonfiction, poetry, travel and personal essays. She was named Prose Writer of the Year in 2013 by the Kansas Authors Club. A former teacher, she continues to teach through the written word. 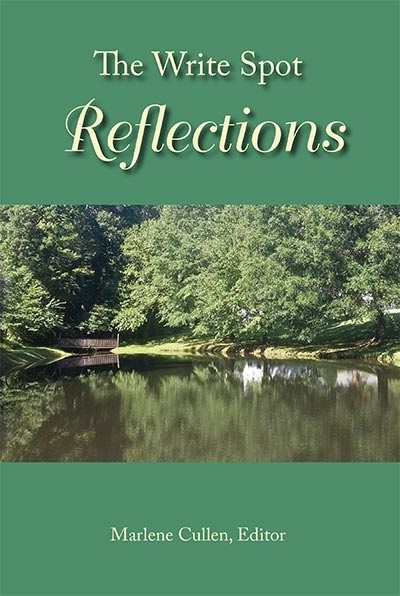 The Write Spot: Reflections, reviewed by Nancy Julien Kopp. At the end of each contributed story, poem or vignette, the prompt the writer used is given. The editor, Marlene Cullen, has a blog filled with prompts. She also uses prompts and freewriting in her writing workshops which she teaches in California. I would love to live close enough to attend. Even halfway across the country, I can benefit from the prompts on the blog. I found that reading the piece in the book and then the prompt was sometimes an ‘aha’ moment. Also a learning moment. I found myself thinking many times Look where this writer went with a simple little prompt. I thought about using the same prompts as the authors in the book had done for my own writing exercises. I think it would benefit any writer or wannabe writer to use the prompts for inspiration. Note from Marlene: The Write Spot Reflections is available through Amazon for $15 (print version) and for $3.49 (as an ebook).